From the recovering from the Afrofreque show department... it's Poppin' Off Art Exhibition and Fundraiser @ Silhouette on Feb 12th. 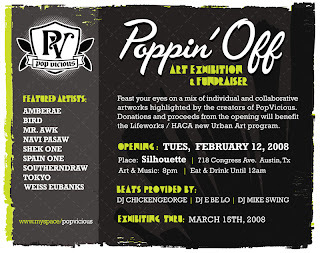 Artworks provided by PopVicious and beats by DJ Chicken George, DJ E Be Lo and DJ Mike Swing. Donations and proceeds from the night will benefit the LifeWorks / HACA new Urban Art program. Our mission is to transition youth and families from crisis to safety and success. Our community has grown 65% during the last ten years, resulting in increased cost and stress to daily life. The overall cost of living has increased by 30%. There are now 200,000 "working poor" families. More than 20% of our youth experience mental health challenges. Sixty-one percent of all victims served by the Austin Police Department in 2001 were for domestic violence or child abuse. LifeWorks provides the most comprehensive network of services for youth and families in Austin. We offer a safety net of support to more than 10,000 youth and families every year. LifeWorks’ services to runaway and homeless youth are a national model, providing a pathway from street life to self-sufficiency. We are the largest local provider of free and affordable counseling to youth and families. Our youth development training opportunities prepare youth to become healthy, successful adults. LifeWorks is the only area agency to achieve national accreditation from the Council on Accreditation for Services to Children and Families and win an award from the Greater Austin Quality Council. LifeWorks’ ability to mobilize resources to support youth and families is evidence of the organization’s creativity, energy and commitment. We invite you to learn more about LifeWorks and to become part of the strong network of caring individuals that creates opportunities for success.